82 MMS November 2017 mmsonline.com FEATURE AUTOMATION ADDITIONS Phoenix Proto has three high-speed machines and three conventional CNC machines. 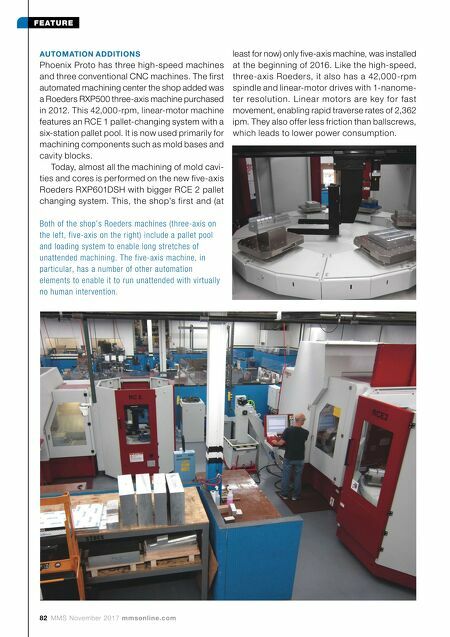 The first automated machining center the shop added was a Roeders RXP500 three-axis machine purchased in 2012. 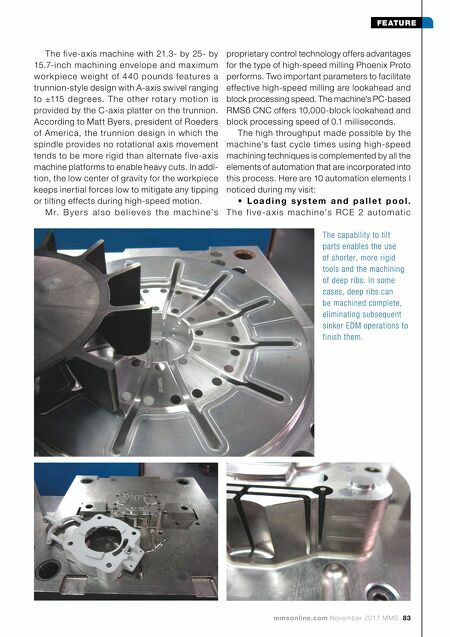 This 42,000-rpm, linear-motor machine features an RCE 1 pallet-changing system with a six-station pallet pool. It is now used primarily for machining components such as mold bases and cavity blocks. Today, almost all the machining of mold cavi- ties and cores is performed on the new five-axis Roeders RXP601DSH with bigger RCE 2 pallet changing system. This, the shop's first and (at Both of the shop's Roeders machines (three-axis on the left, five-axis on the right) include a pallet pool and loading system to enable long stretches of unattended machining. The five-axis machine, in particular, has a number of other automation elements to enable it to run unattended with virtually no human intervention. least for now) only five-axis machine, was installed at the beginning of 2016. Like the high-speed, three-a xis Roeders, it also has a 42,000-rpm spindle and linear-motor drives with 1-nanome- ter resolution. Linear motors are key for fast movement, enabling rapid traverse rates of 2,362 ipm. They also offer less friction than ballscrews, which leads to lower power consumption.